It makes me a little sad, that he doesn’t know what a gryphon is. Yeah I mean griffons rule! It makes *me* a little sad that you don’t know it’s spelled griffin, not gryphon. It makes *me* a little sad that you go around being arrogant at strangers on the internet, especially since you apparently don’t know that “griffin” can also be spelled “gryphon” or “griffon” or “gryphen” or “griffen” or “gryphin” – they’re all accepted spellings! The word comes from the Greek “gryps” via the Latin “grÈ³phus”, so techincally “gryphon” is closer to the original than “griffin”. Before you go correcting people, make sure you’re correct yourself! SHUT UP! WE DON’T NEED TO KNOW THAT MUCH! Thank you, Zelda Freak. You are my new favorite person. The way I see it, griffons (or gryphons) with an “o” have four leonine legs, while griffins (or gryphins) with an “i” have leonine hind-legs and aquiline fore-legs. The ears on that thing I’d normally associate with a hippogriff, being a bit more equine in appearance… but one could claim the limbs don’t really match in that regard. So no… I don’t really know what that flying thing is either. Probably the forbidden lovechild of a griffin and a hippogriff. Now now everyone. Play nice! Now is when those boxers might get really embarrassing. I repeat, look beyond what is to what can be… The boxers are now issue until someone makes them so – and it is coming. ironbandit… how are the boxers an issue? 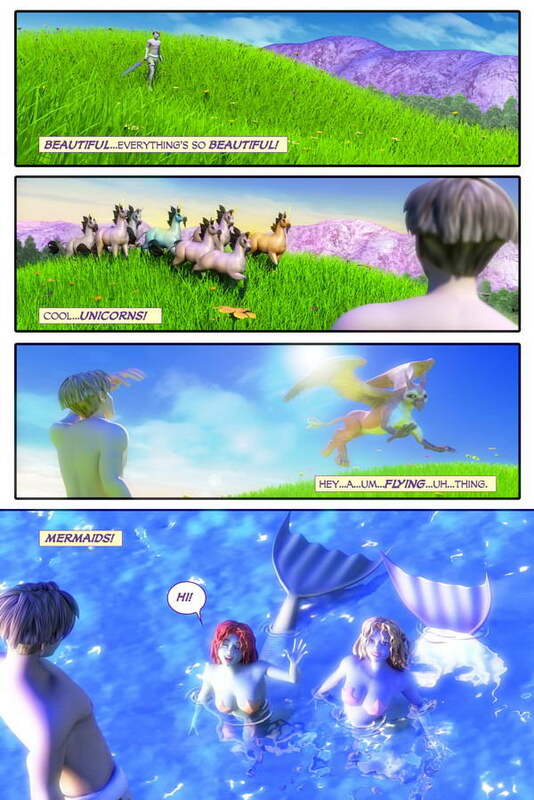 the mermaids aren’t wearing much, so why should they care how much he wears? Well maybe not the mermaids, but someone’s bound to say something about them. The gold unicorn is now officially named KATIE! Woo-hoo! Scott’s first comment in the comment section! It’s like an Acid trip gone wrong ._. Huh, I quite like the fact the gryphon has glare from it’s wings. And that is how the Scott-Sava brand of Griffon hunts for it’s prey, the double D tactic of hunting, dazzle and devour. ….now I’m just being to depressing. =P This commenting malarky is haaaard. The Gryphon is so shiny look away before it eats you. Looks like the time of slashing didnn’t come yet :(. Hehe, he’s old enough to notice women now. Whatever that thing is, it definitely isn’t a gryphon.